See more of the movie with Alcons cinema sound! In today’s cinema market, several developments are taking place, that greatly effect the importance of cinema sound reproduction. Developments that are relating to the technical- , commercial- as well as the marketing side of the cinema industry. After the digitalization of cinema over the last few years and further developments in projection (3D, 4k, laser), the industry focus has turned to audio, triggered by new surround concepts, such as Dolby Atmos and Auro-3D. At the same time, digitalization of the complete B-chain, automation, networks and remote-monitoring play a more important role than ever. Another (commercial) result of digital cinema is the changing role of the cinema from simply presenting movies, towards re-developments like 3D experience and “alternative programming” presentations, like live broadcast/transmissions (soccer/football, sports), (video)conferences (business seminars/presentations), musical events (concerts, record launches), and more. The marketing side of the cinema industry sees increased competition between cinema exhibitors. In the increased competition, exhibitors are experiencing that emphasis of quality over price is essential for long-term profitability; Differentiation in concepts (“premium theatres” a.o.) brings opportunities to distinguish themselves from the next-door cinema. And last, but definitely not least, patrons’ expectations have raised tremendously; The combination of "CD-quality" sound/vision (BlueRay, DVD, HD-audio), together with the sensitive-priced surround-sound home-theatre systems, make cinema compete with the “living-room experience”. Cinema has to do utmost efforts to exceed customers expectations. With these new (digital) developments entering the cinema market, new challenges have arrived for existing equipment; Requirements of the sound system have changed; Speech, music and effect should be reproduced with finest detail and fullest dynamics. With the digital cinema sound standard stating “non-compressed” 24-bit sound format, current loudspeaker reproduction systems, utilizing compression-driver technology, are not capable of reproducing all digital cinema has to offer. New challenges require new thinking: Understanding the relationship between speaker and amplifier, Alcons Audio now brings an evolutionary Digital Cinema sound system program, with speakers, amplifiers and dedicated processing. Specifically looking at the “end” of the B-chain, current speaker systems are not suitable for reproduction of what non-compressed digital sound sources have to offer; Not only frequency response, but also transient response is an important “ingredient” for detail and (speech)intelligibility. And dynamic response is essential in Digital Cinema reproduction, with 24-bit dynamic range. Note that all current sound systems are still based on 90 year old (compression) driver loudspeaker technology for mid/high frequency reproduction! Alcons Audio's R&D hast taken up the challenge implementing her know-how to design new cinema sound solutions from ground-up to enhance the Digital Cinema experience. Alcons' pro-ribbon transducer technology enables a non-compressed 1:1 reproduction of the movie soundtrack, from the most delicate vocals to even the largest explosions. The unusual high peak power handling caters for a 1:15 dynamic range. But the evolutionary designs go beyond HiFi sound quality with digital dynamics; Amplifier/speaker synergy (enabling low-impedance speakers with effect of long speaker cables actively compensated), coverage control (less variation in front-to-rear SPL + wider stereo coverage), space economy (designs as slim as 7"/18cm!) and performance reliability (no blown-up speakers) are other important design parameters that are taken into account. By implementing her recognized line-source technology into cinema sound system design (an industries' first), Alcons enhances the cinema experience even further. 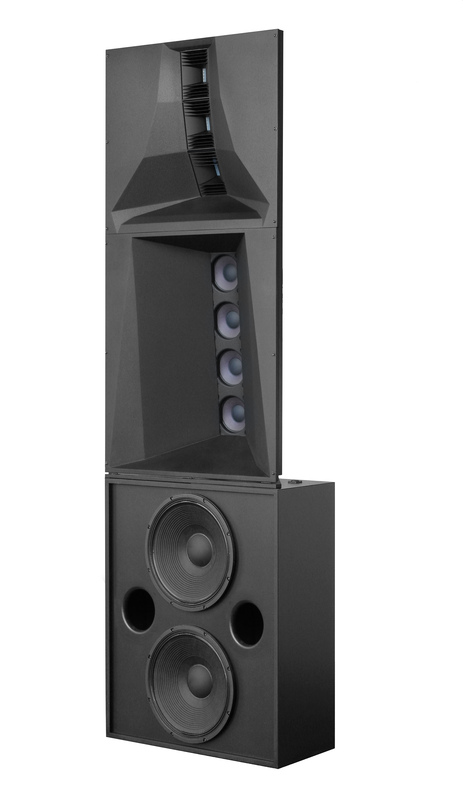 The acoustical coupling from this array technology reduces the typical SPL drop-off from front to rear (up to 12dB in medium-sized rooms) significantly; the resulting "proximity" effect dramatically enhances the cinema experience for the audience further away. For the first time ever, live-concerts, performing arts theatres, (post-production) studios as well as premium cinemas around the globe are able to utilize exactly the same, unique sound system technology with high-end reference quality at any SPL. The C-series systems deliver a 1:1 reproduction of the original source, with all stereo and position information as recorded in the studio. This makes a very significant different listening experience compared to traditional systems. The C-series offers a dedicated (!) 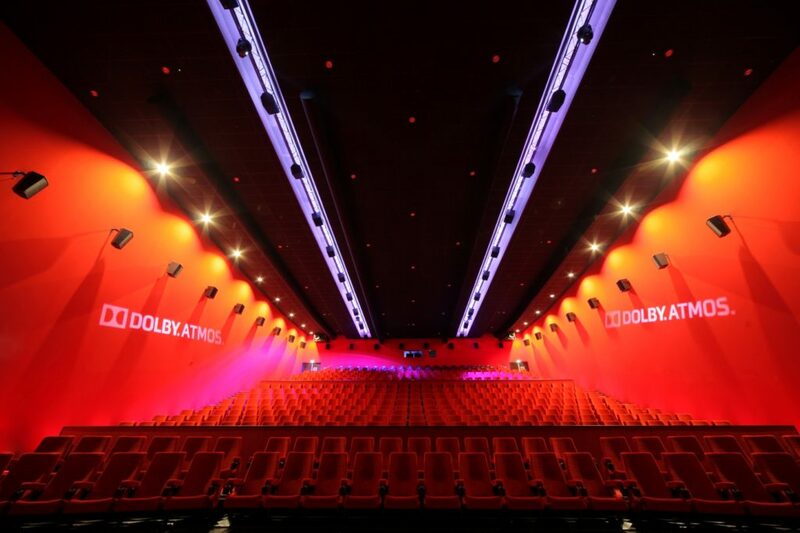 solution for literally every size cinema; With the Cinemarray™ concept, even cinemas above 500 seats and (way) beyond, can offer patrons all that Digital Cinema has to offer, without any compromise. HiFi sound at Digital Cinema SPL’s! The RBN pro-ribbon drivers have up to 90% less distortion than any conventional mid/high transducer (@ same SPL), because of the lack of a compression chamber and the light weight diaphragm. By implementing line-source technology, the normal (-6dB per doubling of distance) reduction of SPL coverage from front to rear is reduced; The resulting “proximity” effect dramatically improves the cinema experience for the audience further away from the screen. This technology is featured in the CR4, CR5 and Cinemarray™ system. The fast transient response + the lack of compression “threshold” (the level under which the compression driver doesn’t make enough compression to have actual HF output) brings perfect intelligibility and tonal balance at lowest as well as highest SPL’s. Another advantage of the acoustical system coupling in general and the cylindrical wavefront of the pro-ribbon HF array in specific (in the CR4, CR5 and Cinemarray™ systems), is the very precise vertical projection, preventing unwanted ceiling reflections for further improved intelligibility. Another benefit of the superb transient response and the lack of “time-smear” (a result of the slow moving mass/diaphragm at high frequencies) is the lack of listening fatigue, even after prolonged listening hours. It’s hearing instead of listening. The RBN pro-ribbon drivers features Alcons’ patented “Real-90” dispersion in the horizontal plane, up to and beyond 20kHz. This offers patrons a much wider stereo “sweet-spot”, thus more people can enjoy true stereo. By utilizing exactly the same transducer components for the surround system, as for the mid-high section of the screen system, a unique voice matched surround system with identical MF/HF components is available, for perfect screen/surround blending, resulting in a very uniform sound stage. Where conventional (compression driver) technology has an RMS-to-peak ratio of 1:2 (i.e. 75W RMS / 150W peak), Alcons pro-ribbon drivers have an RMS-to-peak ratio of around 1:15 (i.e. 70W RMS / 1000W peak). Together with the ultra-low power compression (resulting from the patented heat management + the direct air contact of the voice-coil) this enables the maximum dynamic range that 24-bit Digital Cinema has to offer. The CR4, CR5 and Cinemarray™ CRA30 systems have a 2400W peak power handling. As a result of the flat impedance of the pro-drivers, no impedance correction is needed in the crossover. This allows simpler filter designs, placing fewer parts/obstructions in the signal path, thus offering improved clarity and accuracy of the sound even with passive-filtered systems. The “Current-to-light” driver protection, inaudibly protects the drivers for input overload. The Alcons systems are SIS™ pre-wired for SIS (Signal Integrity Sensing™) circuit; In combination with the ALC controller amplifier, influences of long speaker cable lengths (typically for cinema!) are completely compensated for (system damping factor 10.000). The processing “heart” in the ALC changes the stereo amp into a dedicated powered controller of the Alcons speakers, offering dedicated excursion protection, system –eq, filtering and power control, for maximum component performance. The ALC controller-amp has 4 individual AES3 digital signal inputs, that can handle sampling rates up to 192kHz. The custom-designed Sample Rate Converter features high-end HiFi quality sampling conversion. Internal operating sample rate is 96kHz. The ultra-thin enclosure design (CR1 7”/17cm deep, CR2 10”/25cm, CR3, CR4, CR5 13,7”/35cm) enables mounting behind any screen. With the moveable mid-high section, the directional frequencies can be aimed at the audience, while still enjoying the shallow system depth. Extra room for more seats, raising your return-on-investment! The CR1 and CR2 systems, but also the CB151/181/211 ultra-shallow subwoofers can be stacked or flown or wall-mounted behind the screen. Virtually any set-up is possible. For cinema applications, it can be desirable to give the surround system a "stealth appearance"; Through ACO™ Architect Color Option is each system available in any RAL scheme color, to have the system blend into any interior style. As Alcons truly believes in the quality of her handcrafted/computer-controlled products, the systems are backed by a 6 years limited warranty, when used with ALC amplified system controller; “we put our money where our mouth is!”.